Today marks an auspicious day for all tamil speaking people , Yes, It's TAMIL NEW YEAR .. I wish all my friends , a happy and a prosperous new year..
Beside my wish, lies a great effort in posting today's entry. My laptop was stopped working last day all a sudden . But it was working fine and I's fine surfing till late night the other day. I tried everything to my knowledge and gt hold of my bro from India over the phone to get some extra help. But, nothing worked out as my bro cannot troubleshoot anything from there without taking a look at the source. I's so naive , wanted to put an end to this misery . Poor Shanu ... ( Yep, I say myself .. ) Finally, my dear H came to found the problem . I am told that hard disk had gone... phew .. But my dear H , bought the hard disk immediately and to my convenience , installed the Linux OS till we receive our recovery cd's. U know what , ..it's very tough for me to use this OS, as i'm not aware of anything abt LINUX.. Seriously, breaking my head here guys, am just relying on google for everything ... Hope I receive my cd's soon... That would be lovely..
Today I made masala vada and channa dal kheer for new year celebration. Both tasted so great and we ( I -- My H doesn't like channa kheer ) thoroughly njoyed !!! Soak the channa dal and javvarisi seperately for minimum 30 minutes and cook together with water / milk for 2 whistles or cook in stove top. Mash the dal little bit with the back of the spoon. Heat a pan with the ghee and fry the cashews , saara paruppu , raisins to light golden brown and keep aside . Add the jaggery powder and little bit of water and dissolve completely and filter the syrup. Pour the syrup back to the kadai and add the mashed dal mixture . Let the payasam comes to a boil for 2 minutes and finally add the fried nuts mixture and switch off and ur neivedyam is ready to offer GOD. Wish u happy Tamil New year !! 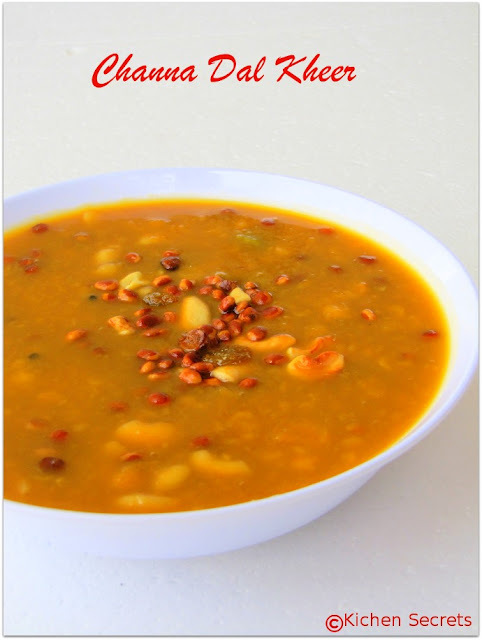 Channa dal payasam looks so wonderful and YUM !! A Very Happy New Year to you and your family. Payasam looks delightfully inviting. Great preparation. Happy festivities to you and family dear! Payasam looks scrumptious- a new recipe for me! But u will overcome everything like a dew.ha ha ha.great looking kheer. Yo shanu!! happy new year!! I am back and loved your kadala parippu payasam!!! awesome..we normally use coconut milk instead of milk.. Happy Tamil New Year! 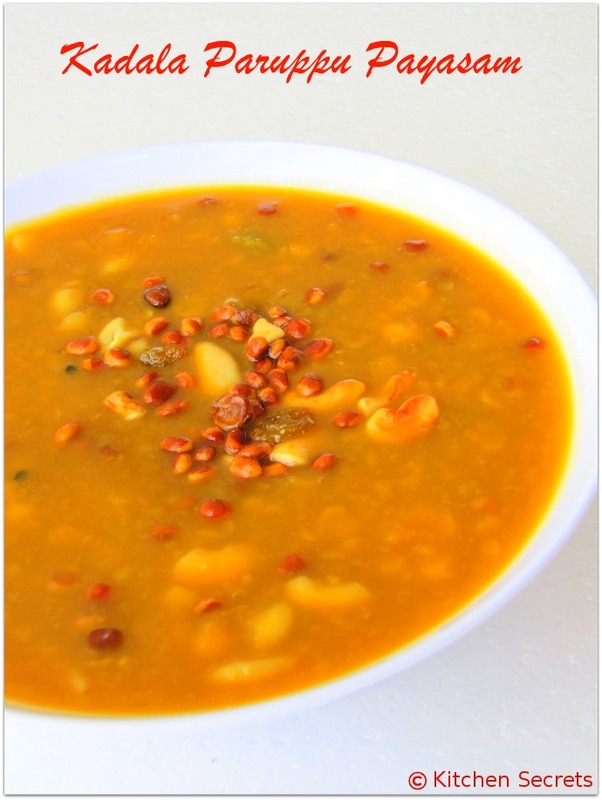 Channa dal payasam looks delectable! looks amazingly mouthwatering..tempting n yummy..
What u yummy payasam...Happy new year to u and family!! Oh that so sad about ur system..Happy new year wishes dear, channa dal kheer looks inviting.. This sounds interesting! Just fantastic. Happy Tamil New Year to you! happy New Year! The payasam looks awesome and delish! எனக்கும் இந்த பாயாசம் ரொம்ப பிடிக்கும்..இனிய தமி புத்தாண்டு வாழ்த்துக்கள்!! Happy tamil new year to u!!! The payasam looks fantastic..Totally love the color!! Wishing u & ur family a happy Tamil New year !!! What a traditional and delectable recipe!!! My belated wishes to you and your family. That's an intersting combo and the kheer is very appealing. happy tamil new year to u and ur family, the payasam looks so yummy! Payasam looks very tempting! Happy New Year! Happy Tamil New Year to you and your family Shanavi. Payasam looks mouthwatering. Delicious. Thirunelveli Halwa -- 200 th Post !! !